The Practice partakes in the national primary childood immunisation programme, with both our Doctors and Nurses administering vaccinations. The majority of invites for vaccinations will be sent to parents by NHS Norfolk and Waveney Commissioning Support Unit, although we also send some letters ourselves. A childs first vaccinations are administered at the same consultation (8 weeks) as the GP completes the post natal check for mothers. The invitation for the final primary immunisation at between 15 and 16 years is also sent by the Practice. The local School Nursing Service arranges the immunisation programme for girls aged between 12 and 13, who are offered an HPV vaccination against cervical cancer caused by certain types of Human Papillomavirus. This immunisation will happen at school. Click here for the national immunisation schedule from NHS Choices. Click here for full details of qualifying groups. A vaccine to prevent shingles, a common, painful skin disease is available on the NHS to people in certain age categories. Our Practice Nurses administer the vaccine to our patients. The injection is given as a single vaccination into the upper arm. Unlike the flu jab, you'll only need to have the vaccination once and you can have it at any time of the year. The shingles vaccine is expected to reduce your risk of getting shingles, which can be very painful and uncomfortable. 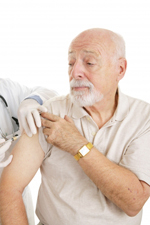 It is fine to have the vaccine if you have already had shingles. For details of this years qualifying groups and catch up campaigns click here.